Manti fillings (photo 2) vary depending upon provenance, seasonality, and recipe (they’re actually Turkic/Central Asian) and are typically found bursting with juicy, deliciously seasoned lamb and onions diced into tiny chunks (when they’re hot, unlike these), although pumpkin varieties are not at all uncommon. Khinkali from Georgia, a Christian nation (Uzbekistan is predominantly Muslim) usually contain a mixture of ground pork and beef. And how do they taste? I thought you’d never ask. That’s where personal experience comes into play. And if you join me on my Little Odessa ethnojunket this Saturday, October 20 (pretty sneaky, right? ), we’re likely to procure one or the other or both as we eat our way along Brighton Beach Avenue in Brooklyn. If you’d like to join us for the adventure, please click here for more information and to sign up. Hope to see you then! 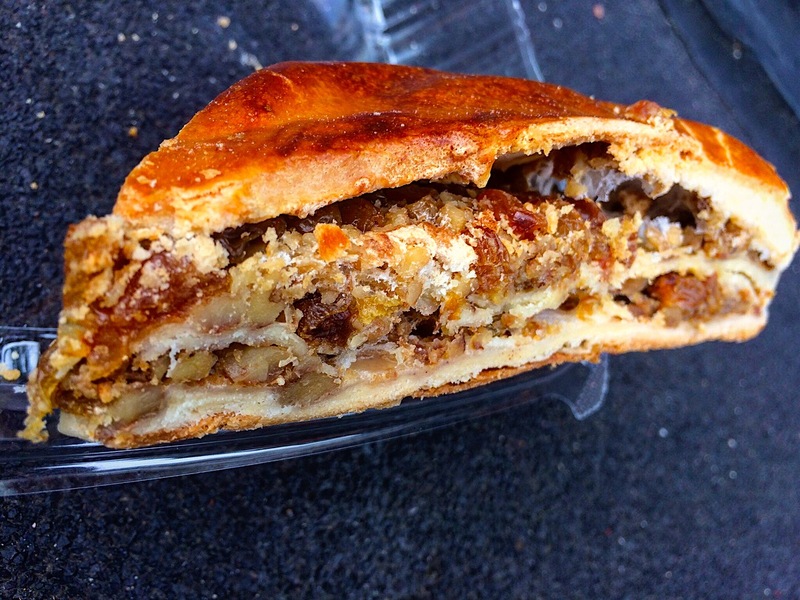 If you’re someone who likes the sweet chopped walnut essence of baklava (like me) but doesn’t appreciate a beehive full of honey with every bite (also like me), check out the pastry they call Pakhlava at Georgian Deli & Bakery, 2270 86th Street in Gravesend near the border of Bensonhurst, Brooklyn. 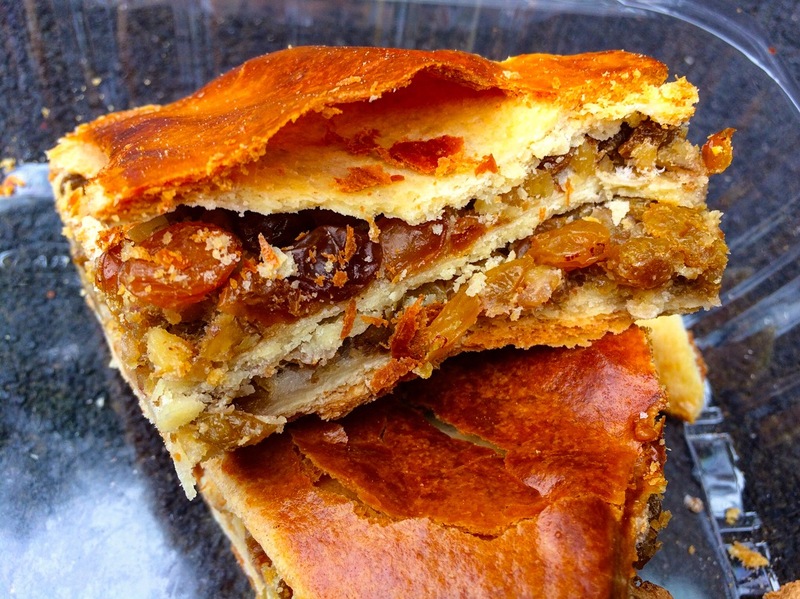 It’s layered like baklava but the dough is richer, more substantial, and sour cream based as opposed to the gossamer phyllo leaves you might expect from the name; the sweetness comes from dried fruit instead of honey. To me, the names are more similar than the pastries themselves. Second photo reveals even more layers of lusciousness. Somewhere between a cookie and a pastry, Qada, one of my favorite treats, is always rewarding, especially with a cup of tea. 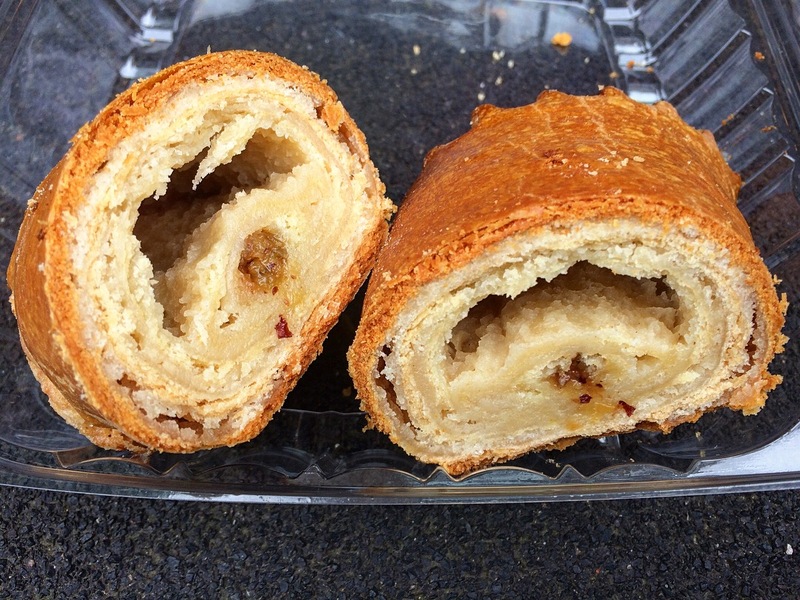 This one came from Georgian Deli & Bakery, 2270 86th Street in Gravesend near the border of Bensonhurst, Brooklyn, where they execute a particularly appealing version of this Georgian delight. Qada (pronounce the Q like a K but in the back of your throat – uvular as opposed to velar for you linguistics aficionados) can be found in two forms, savory or sweet like this one with raisins. The dough is cut, rolled, and glazed with a shiny egg wash then baked to GBD* perfection. Dense, soft, a little crumbly, sweet but not cloying, buttery but not unctuous, it was the perfect culmination of that day’s quest for something to satisfy my sweet tooth. Second photo: what it looked like during the few seconds after I bought it and before I cut into it. 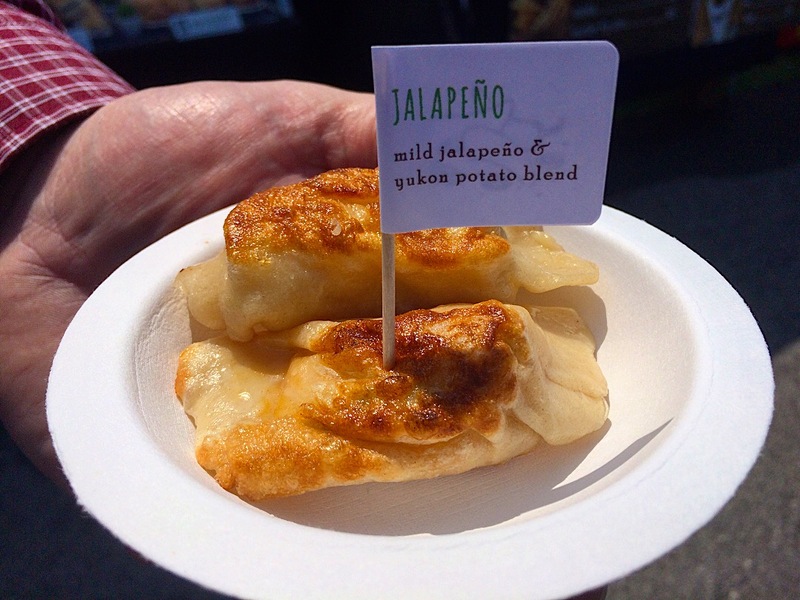 🇸🇰 Baba’s Pierogies (Slovakian style) came through with their jalapeño and Yukon potato blend – a great combo. 🇬🇪 Georgian khinkali with beef, lamb and herbs from Marani. 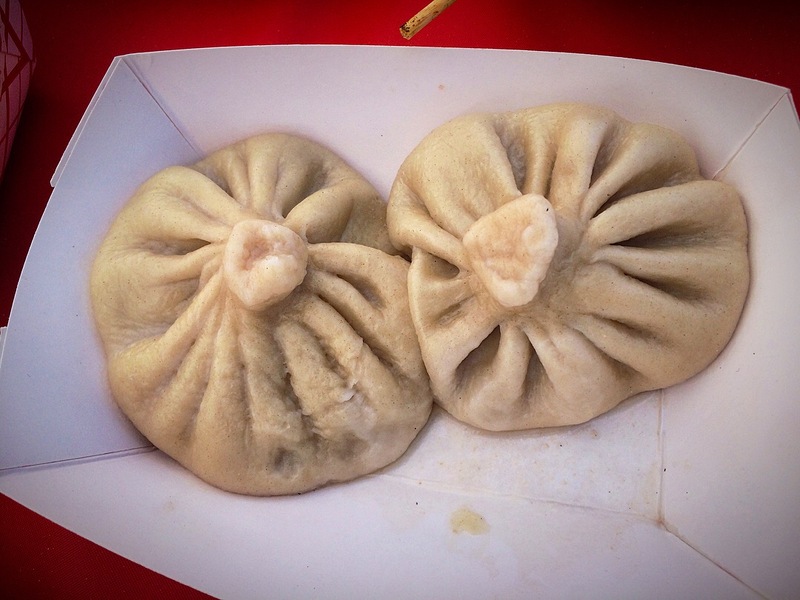 Despite the resemblance, these are definitely NOT soup dumplings. Just grab one by its topknot and bite into its savory filling. 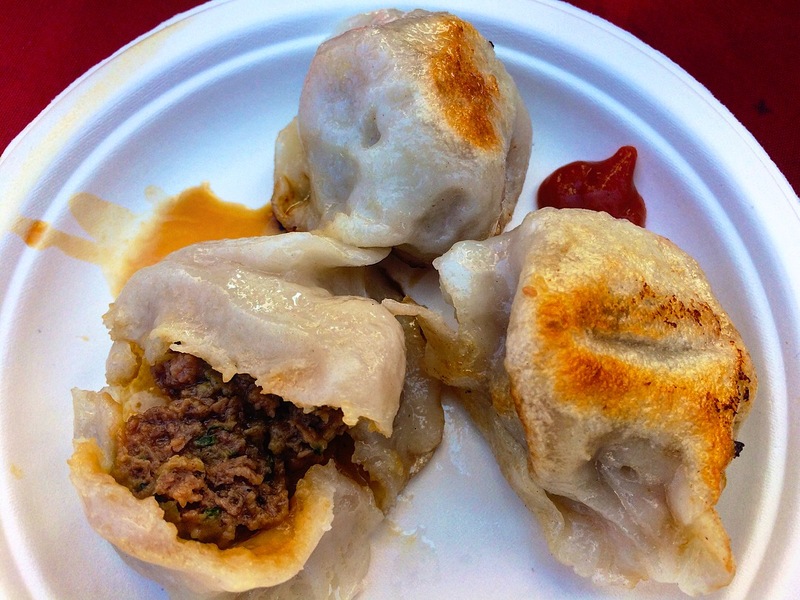 🇨🇳 Dumpling Galaxy’s perfect crispy, tender, succulent lamb dumplings from Northern China. Delicious! My Instagram posts are usually brief takes on restaurants accompanied by a photo or two. (You can see my feed right here, updated almost daily, by selecting the “Instagram” category from my home page – no signup required.) But folks sometimes ask for fuller reviews and more photos, so in response, here’s a more comprehensive report on one of my favorites. As Lead Organizer of The World Food Lover’s Dining Out Group, part of Meetup.com, it’s always my pleasure to bring groups of people to ethnic restaurants that feature cuisines they may never have experienced. 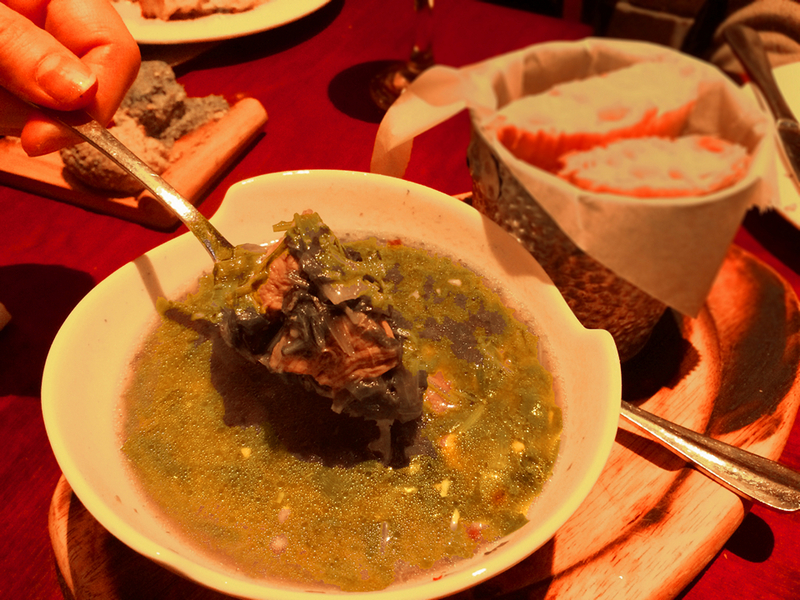 Recently we visited Old Tbilisi Garden, a restaurant that features the cuisine of Georgia. (No, not the US state “Georgia” but rather the Former Soviet Union country “Georgia”.) It seems like there’s a budding proliferation of Georgian restaurants and bakeries around New York City these days, and I, for one, am thrilled about it. Our feast at Old Tbilisi Garden hit the heights but only scratched the surface of this wonderful cuisine. 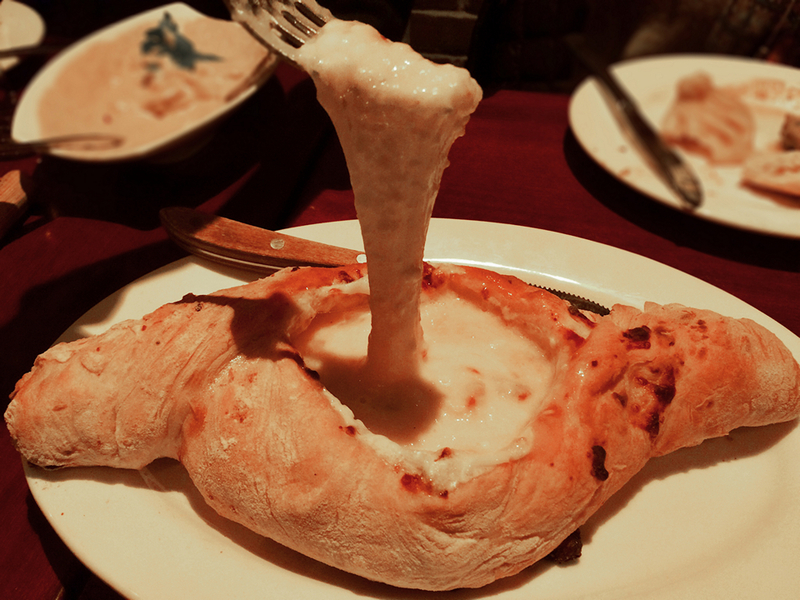 The overarching term is khachapuri, literally “cheese bread,” and there are at least a dozen kinds that I know of. They’re commonly filled with tangy, salty sulguni cheese and imeruli, a fresh crumbly cheese which when melted together combine to make stretchy, cheesy nirvana. Two of my favorites are adjaruli and megruli. 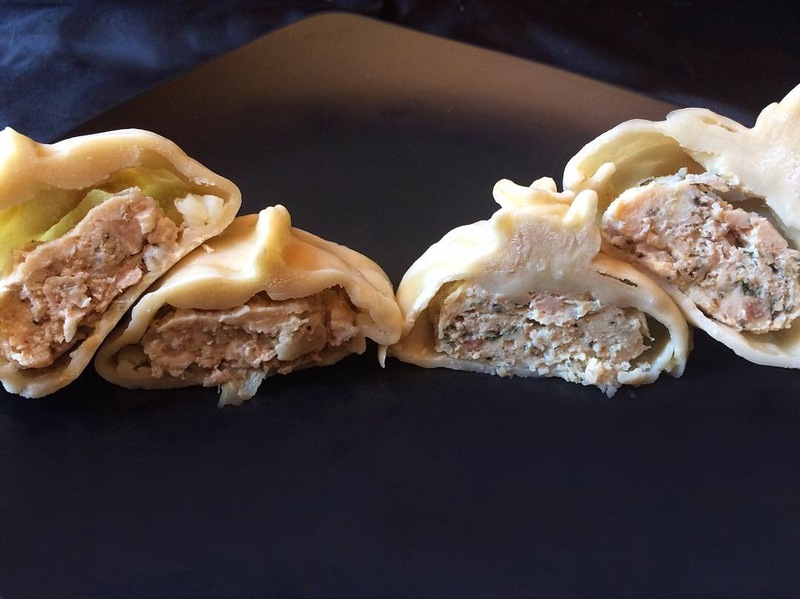 Adjaruli is shaped like a kayak, the center of which is filled with cheese; a raw egg and a chunk of butter are added just as it’s removed from the oven. Stir the mixture: the egg cooks and combines with the butter and melted cheese. Break off pieces of the bread and dip them into the cheese mixture. Now picture hot bread with melted buttery cheese that you eat with your hands, fresh out of the oven – what’s not to like? 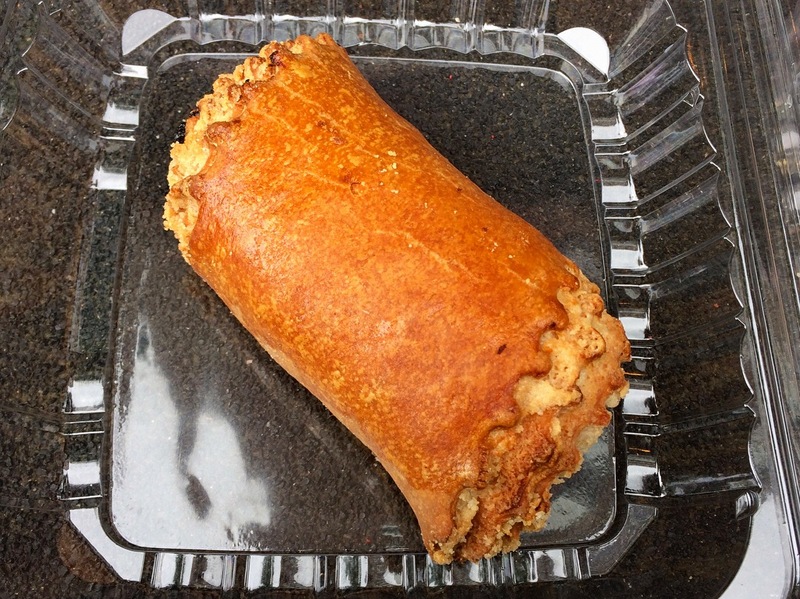 Megruli is a little more self-contained: cheese bread filled with cheese and then topped with more cheese and baked. Did I mention cheese? Think Georgian pizza. 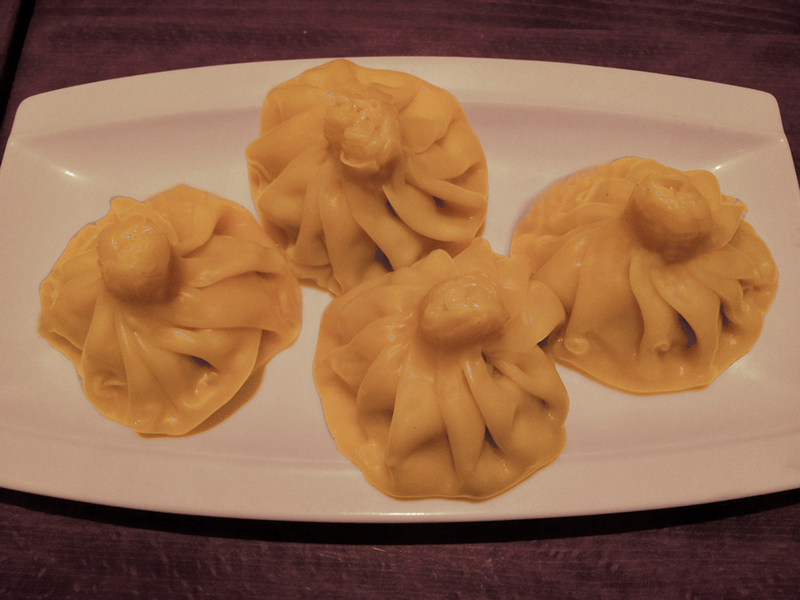 Despite the resemblance, these are definitely NOT soup dumplings. Just grab one by its topknot and bite into its savory lamb filling. They say you’re not supposed to eat that little handle, but I like it, so I guess I’m just going to keep breaking the rules! These tasty spreads fulfilled the vegetable requirement of our meal: spinach, eggplant, and green bean served with Georgian bread called shoti. Bazhe, a Georgian walnut-garlic sauce, was the perfect blanket for the chicken reposing beneath. If you’ve ever tried satsivi, another delicious Georgian dish, then you’re already familiar with the flavor of bazhe – basically satsivi with the addition of pomegranate. Chakapuli is lamb stew in a tangy white wine sauce spiked with tarragon, an herb that figures significantly into the cuisine – and even soft drinks like tarkhun! 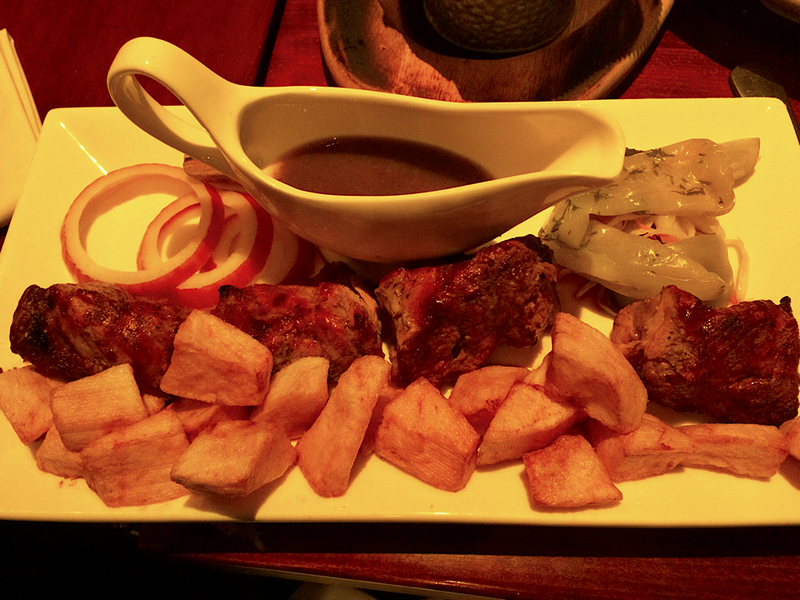 No Georgian meal would be complete without skewers of savory, tender, marinated lamb with delicious tkemali (sour plum) sauce. 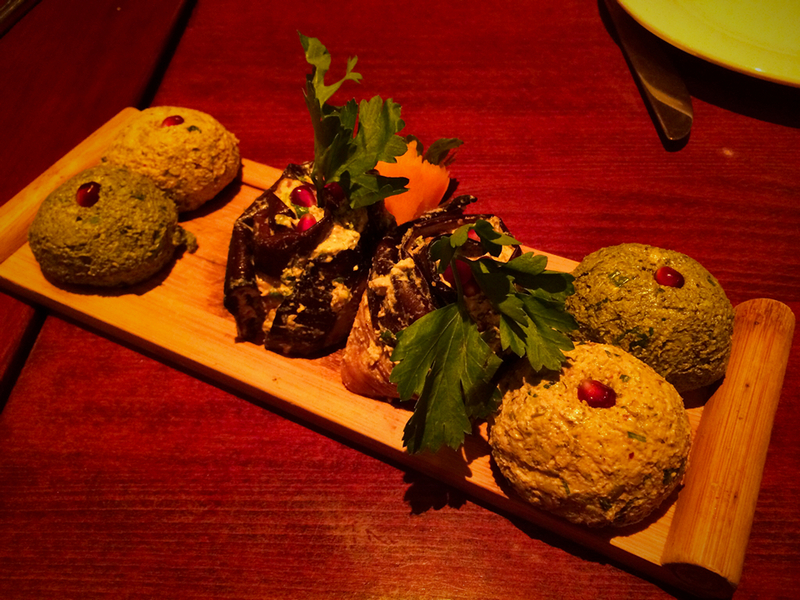 Old Tbilisi Garden is located at 174 Bleecker Street, Manhattan, in the heart of Greenwich Village. Incidentally, if you’d like to be part of the dining out group, you can join Meetup.com (there’s no charge), sign up for The World Food Lover’s Dining Out Group, and then watch your email to see the schedule for our next adventure. Reply to this post and I’ll keep an eye out for you! It seems like there’s a proliferation of Georgian restaurants and bakeries (no, not the US state “Georgia” but rather the Former Soviet Union country “Georgia”) around New York City these days, and I, for one, am thrilled about it. Our feast at Old Tbilisi Garden, 174 Bleecker Street, Manhattan hit the heights but only scratched the surface of this wonderful cuisine. Of course, we ordered adjaruli, one of the many varieties of justly famous Georgian khachapuri (literally “cheese bread”). Kayak shaped and filled with two kinds of melted cheese, butter and an egg, the ingredients are stirred together to create stretchy, cheesy nirvana; always a crowd pleaser. 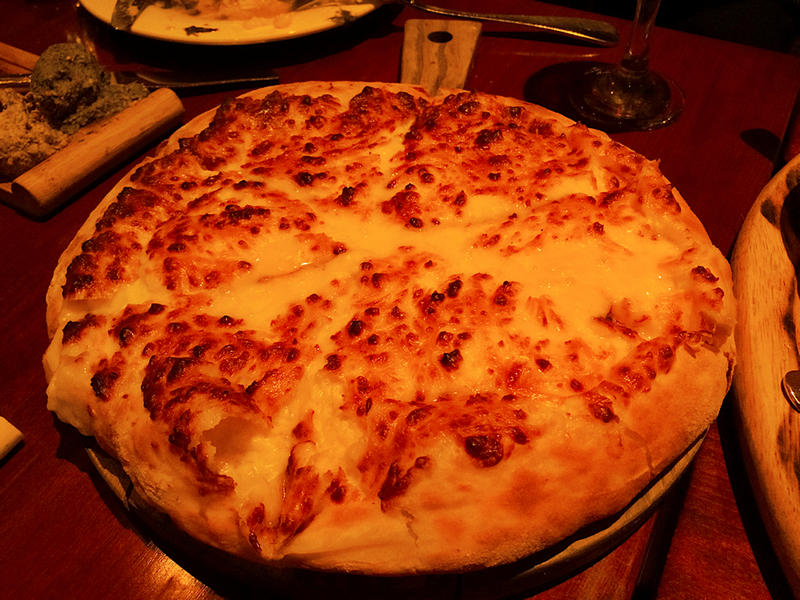 And then, for contrast, we got megruli, cheese bread filled with cheese and then topped with more cheese and baked. Did I mention cheese? Think Georgian pizza. 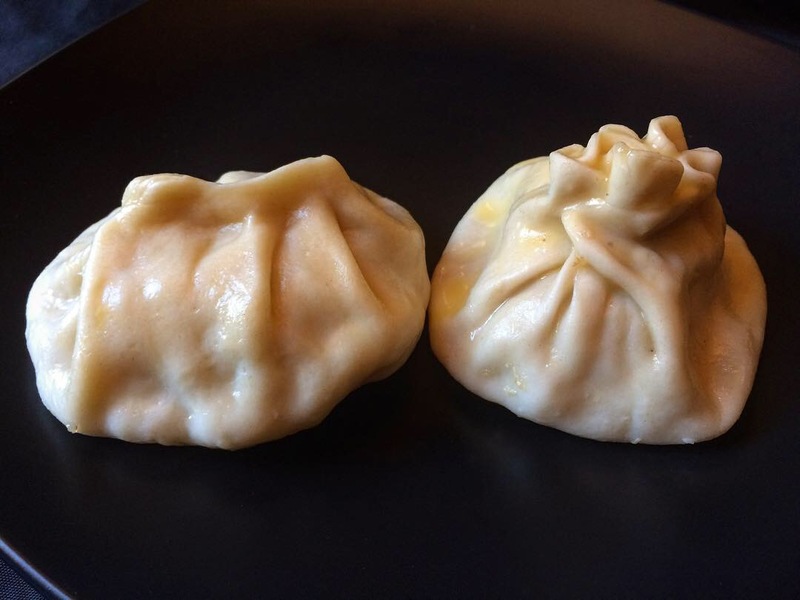 Khinkali – despite the resemblance, these are definitely NOT soup dumplings. Just grab one by its topknot and bite into its savory lamb filling. So good! The Pkhali Trio fulfilled the vegetable requirement of our meal: spinach, eggplant, and green bean spreads served with Georgian bread. 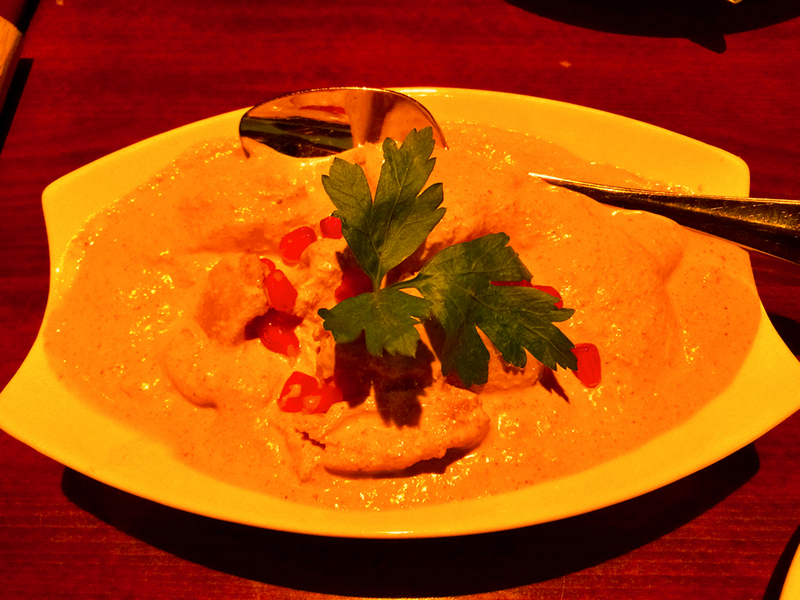 Bazhe, a Georgian walnut-garlic sauce, was a perfect complement to succulent chicken. Chakapuli is lamb stew in white wine sauce spiked with tarragon, an herb that figures significantly into the cuisine – and even soft drinks like tarkhun! Note: Read the complete review here!